Today is Ah Fei 's birthday. Happy Birthday brother. I had introduced Wati to him and tonite is the first time they are going to meet over his dinner. They had been communicating for the past two months on hand phone only, and i am sure the excitement for tonite should be interesting. Before they meet, i advised Ah Fei to be serious in this friendship or later could blossom into a relationship. Please don't use the 'Touch & Go' approach coz it would cause misery and sorrow to either party. According to him, he had never ever fallen in love before though he might have some casual girl friends of the past. I explained to him these. Love has pleasure and pain. When you are loved upon, the joy and happiness is pleasurable but when you are thrown out off love, the pain could be unbearable. The opposite of love is hate. This happen when one is rejected out of love. A normal person could be well behaved in manner, but when hate overrules him or her mind, they could be wild, crazy, mad and unreasonable. These can happen to anyone who is deeply affected by love. You scold with anger, your words are nasty and vulgar to your ex-lover. You might disturb, spy and stalk his/ her movement. You might be violent by punching and slapping your ex. Or perhaps you might get drunk and forget everything, Some might take revenge by sleeping with other men, or calling prostitutes to release his frustration. The worst are those who could not control themselves, they commit sucide or to attack and kill their lovers. Hate blinds and is dangerous. I know Wati is an attractive, innocent and an adorable girl. Equally my brother, Ah Fei is an eligible intelligent man whom i have confidence with. However love is unpredictable and uncontrollable in feeling. I hope Ah Fei and Wati are mature enough to know what they want in lives. Let your five senses decide whether you both are compatible to each other. Time is the answer to your love. Best of luck to Ah Fei and Wati. 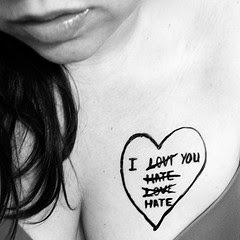 Don't Hate - "Always remember others may hate you but those who hate you don't win unless you hate them. And then you destroy yourself".